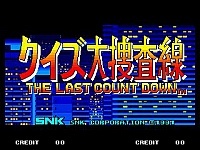 One of my favorites, next to the Quiz Meintantei Neo & Geo. This game has such a dark and serious tone to it, it is definitely worth it. It's all in Japanese, but so what?! I love just guessing them, just to get through the game. The storyline in pictures is wonderful. 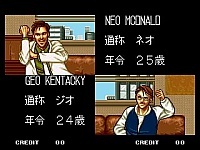 Great job SNK...rumored to have a US release, as the Great Quiz Detective. Because this is a Japanese text only quiz game, I cannot review it properly. If there are any Japanese-speaking people out there that could possibly give me a little info about this game, then please let me know! This is another Japanese language only quiz game; in this one you are a detective or something, from what I can work out at least. You meet different people and have to answer their questions correctly to be able to move on to the next stage. 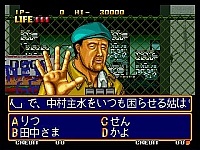 There is also a two-player mode in which you both compete to answer the question correctly first. 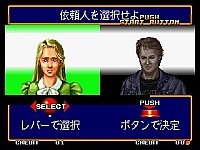 At the start of the game you get to select from either a female or male character, I don't think it makes any difference which one you choose. The graphics in Quiz Daisousa Sen are fairly decent, considering that the cartridge itself is fairly small. You meet different characters that have different animations for when you get a question right or wrong. They are nothing fantastic, but decent enough, considering that it is an old game. The sound isn't all that amazing. There are not many different sound effects and in particular some annoying music. As I mentioned, the game is small, so I didn't expect anything amazing. This game seems OK, but I think that if you can understand it, then you would better off getting either the sequel or preferably Maruko's Deluxe Quiz, which seems like a better game. If you don't speak Japanese, then don't bother. All of the above are Japanese language quiz games.